In our 2011 celebration of National Arts and Humanities Month, we were pleased to present the following talented artists in our annual classical music program, titled "Exploring Artistic Heritage: A Piano and Chamber Music Concert." The program was presented at the Mountain View Center for the Performing Arts on October 16, 2011, and again at the School of Arts & Culture @MHP on October 23, 2011. Pianist Patricia Cheng has performed as a soloist and as a chamber musician in recitals and festivals throughout the United States and abroad, and has been praised for her thoughtful programming and sensitive musicianship. In 2010, she explored the music of artists in search of national identity, in a concert titled "Finding Home: A Kaleidoscope of Musical Journeys." Her recent appearances in the San Francisco Bay Area include performances at the Mountain View Center for the Performing Arts, Stanford University, the Palo Alto Art Center, the Community School of Music and Arts, and Foothill College. She earned a master’s degree in 2005 from the San Francisco Conservatory of Music, where she studied with Paul Hersh and was named a finalist in the school’s annual piano concerto competition. Ms. Cheng is also a recognized leader in arts advocacy, having been selected to participate in 1stACT Silicon Valley’s Multicultural Arts Leadership Initiative in 2009. She served as a member of the City of Mountain View’s Performing Arts Committee from 2003 through 2010; and, as Chair for five years, she worked to expand the scope and impact of the Committee’s initiatives. 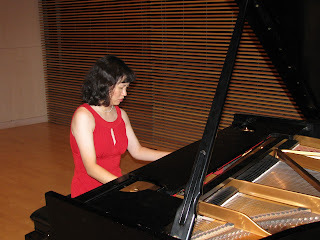 An active member of the Music Teachers’ Association of California, Ms. Cheng currently teaches piano at the New Mozart School of Music. Her work as a performer, educator and arts advocate has been supported by grants from Arts Council Silicon Valley, 1stACT Silicon Valley and the Castellano Family Foundation. Ms. Cheng earned her undergraduate degree with honors in English from the University of Chicago. She also won the prestigious Donnelley Cambridge Exchange Fellowship, which enabled her to study music for one year at Cambridge University. Ms. Cheng then attended Yale Law School, where she earned a J.D. while actively continuing her piano studies. French hornist Armando Castellano is a musician and educator originally from San Jose, now living in Menlo Park, California. Mr. Castellano graduated with honors from San Jose City College and the University of California at Los Angeles where he studied with Bob Watt and Richard Todd. He then attended the Manhattan School of Music in New York City, where he studied with Erik Ralske and Jerome Ashby and received a master’s degree in the school’s Orchestral Performance Program. He attended the Aspen music festival and participated in several tours with the Russian American Youth Orchestra. Mr. Castellano has performed in many of the Bay Area’s regional orchestras and has spent much of the last ten years organizing and performing chamber music. He is the founder and director of the wind quintet, Quinteto Latino. Through his work with this unique ensemble, Mr. Castellano has cultivated opportunities to perform classical music that is culturally relevant to him and his community. Mr. Castellano has taught throughout the Bay Area in both English and Spanish and is currently an adjunct faculty member at San José City College. Violinist Po-Wei Lai, a native of Taiwan, began his violin study at the age of six. Mr. Lai has also studied piano, Chinese violin and Chinese viola. At the age of 11, he was a soloist with the Gwung-Fu Orchestra; and at the age of 14, he was a soloist with the Double-Ten Orchestra in Taichung, Taiwan. In the same year, he performed in Alice Tully Hall at Lincoln Center in New York, as a concertmaster with the Double-Ten Orchestra. Mr. Lai completed his undergraduate and graduate violin studies with merit scholarships at the Peabody Conservatory of Music at Johns Hopkins University, and has won first prize in various competitions, including the Taiwan National Competition and the String Competition of Niagara International Chamber Music Festival. Moderator Hector Armienta, a nationally recognized Mexican American composer, focuses on creating work that explores the Mexican and Mexican-American cultural experience. He has received awards and commissions from Meet the Composer, the National Endowment for the Arts, Arts International, Opera Pacific, the Pacific Symphony, the San Francisco Arts Commission, the Oakland East Bay Symphony, Western Stage Theater and others. Currently, he is developing his most ambitious project, a music theater trilogy titled AGUAS ANCESTRALES/ANCIENT WATERS, which has had support from an NEA grant for artistic excellence. In January 2012, La Llorona (part I of the trilogy) will have its New York City premiere, followed by a new production of the work in San Jose in the fall of 2012. Opera Cultura, of which he is the founder and artistic director, will present the West Coast production. He also serves as the Program Director for Music4Schools at the Community School of Music and Arts and sits on the advisory committee for SVI/O, a collaborative initiative of the City of San Jose Office of Cultural Affairs and ZER01. For more information about Mr. Armienta, please go to www.operacultura.com.